Visiting Angkor Wat should be on everyone’s bucket list. If you’re planning a trip, below you will find some helpful tips as well as photos that will inspire you to book a flight that much sooner! This UNESCO World Heritage Site is considered to be one of the most important archaeological sites in Southeast Asia and is the biggest religious monument in the world. It was built between the 9th and 15th century as a place to worship Hindu gods. Today visitors can see over 100 stone structures that are still standing (there used to be even more structures but they were made of wood so they have not survived over the centuries). In the early 1400s, Angkor Wat was ransacked by the Thais which led to it’s abandonment. Over the next few centuries, people stumbled upon the ruins and began creating stories about its origins. Then, in the late 1800s, the French brought new life to the religious complex and began massive restoration projects. For our visit, we chose to hire a tour guide. We know there are some people that prefer to see things on their own (and we saw plenty of people walking around while reading Angkor Wat guide books) but we prefer getting a guide. They know their history, can maneuver you around other tourists, and can time everything really well if you can only be there for a few hours. We actually started our visit to Angkor Wat at the back entrance. There were hardly any people there and it was still really quiet. Later on we saw how many people go through the front entrance and we don’t think our first glimpse of the ruins would have been nearly as magical, so we’re glad our guide made the recommendation to work our way backwards through the complex. The next few hours were spent exploring the grounds. Unfortunately most of the sculptures were desecrated in one form or another during the ransacking, but the carvings found throughout are still in great shape. Visitors will notice apsaras, or heavenly nymphs, everywhere. There are over 3,000 of them on the walls and they are all unique. Wall carvings also tell religious and historical stories. In the center of the complex is the Bakan Sanctuary (also known as the Upper Level). Visitors can climb the steep stairs to get some great views, but there will be a wait. Also, only a certain amount of people are allowed at a time, so even if you are next in line you will not be able to go up unless someone else comes down. While we were up there we saw a really cute monkey running along the top of one of the outer walls. And even though there are a lot of people there, you can find areas that are quiet and tourist-free. You just have to look. As we explored we noticed that there is still a lot of restoration going on. Our guide told us it is a global effort, which we thought was really cool. Countries from all over the world are helping to make sure this site is preserved for future generations. And you can really see the difference the restoration is making! In the picture below, it’s obvious how much better the left side looks now that it has been restored. So after a few hours, we were finally at the front entrance. We looked back towards the structures and we thought about all of the photos we had always seen of Angkor Wat. The towers with the small lake in front of it and the thin palm trees on either side. We were finally going to take our own photos of this amazing site. It really felt like a dream to be walking around Angkor Wat. We felt the same way when we were exploring Machu Picchu. It’s something so iconic; something you’ve read about and seen in books and documentaries. So to finally be there… we just wanted to pinch ourselves. – Remember that this is a religious site and should be respected as such. Despite the heat, dress moderately. There are also monks that still live on the grounds, so visitors should be mindful of them as well. – Have water and sunblock. There are plenty of shaded areas, but you will also be in the sun a lot. – Wear comfortable shoes. You will most likely be there at least three hours. – We recommend getting a tour guide. There are plenty to choose from online or once you arrive in Siem Reap. 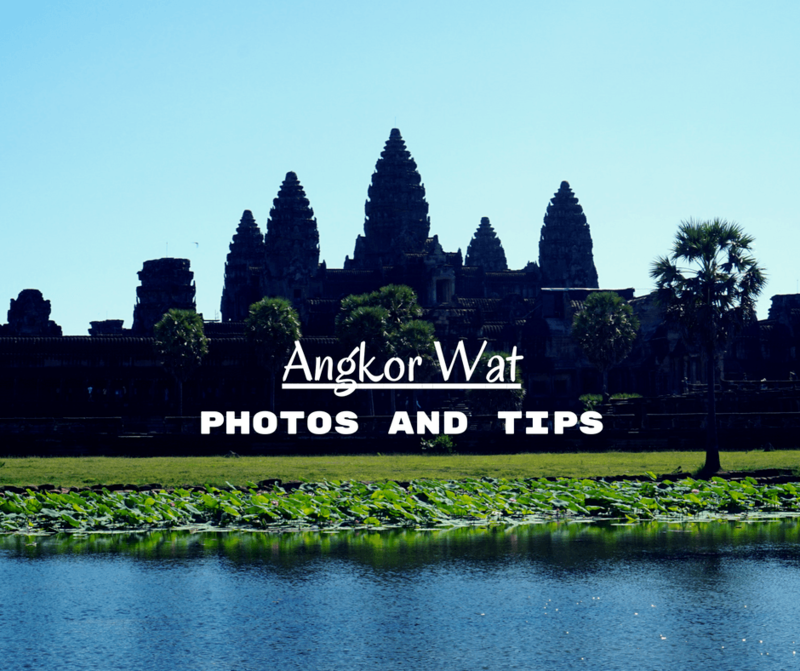 – Angkor Wat opens at 5am for those that want to see the sunrise. However, Bakan Sanctuary (Upper Level) doesn’t open until 7:30am. We had literally just flown in the day before and were leaving back to Thailand the following day. Angkor Wat was the sole reason we had traveled to Cambodia. It was an incredibly short trip, but one that we felt was worth it. It really helped to have a guide, because he knew how to get around them and when to go to certain areas. Truly one of the world’s great wonders, I could spend days at Angkor Wat! Easily! It’s such a huge area! Sadly I didn’t make it here during my recent trip to Asia but will have to make sure I go next time i’m travelling that way. Your pictures make it look amazing! Thank you Claire! I hope you’re able to go next time you’re in Asia! I’ve been wanting to visit Angkor Wat for so long, especially at sunrise. I think it would be an amazing experience. 🙂 Thanks so much for the Angkor Wat tips! I would love to go here. You just made me want to so much more. That’s great to hear Holly! I’ve been to Angkor Wat twice and I loved it both times. I also liked the other temples though like the Pink Temple. Wow, twice? That’s awesome! I’d love to go back and spend more time there.